Bringing unique gifts to customers the world over since 1981. You will find your old favorites such as Calendars and Calendar Refills and some new additions like our new Calendar/Clock Combos, Calendar/Black Board Combos, Picture Frames just to name a few. More new items to come !! So please visit our site often. So just say "Personalize it"
The Country shop is known for it's hand made gifts. Our gifts are greatly appreciated because we take the personal approach, our gifts are hand made, we hand paint our own designs, and all products are made in The Country Shop. We also specialize in personalizing at no charge. New Calendar Fronts Added This Season!!!! For the DIY (do-it -yourselves!! 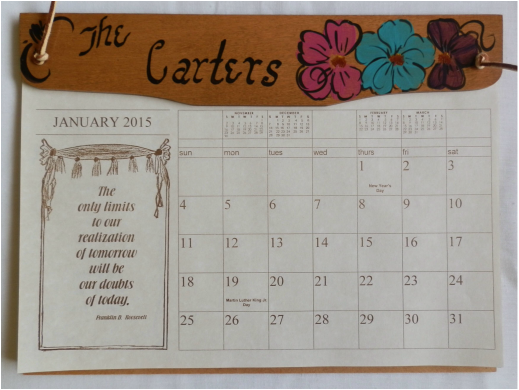 We have had a lot request for calendar fronts with no design so this year we have added four. They are Colonial Red distressed , Blue Lagoon distressed, and White distressed, and Woodtone. We can personalize them for you or you can get them completely blank if you want to add your own design. Also added Sweet Home Alabama and In God We Trust. Check out our new Clocks with Picture frame and Letter of your choice. Also need to look at Picture Frames, Crosses and Special Gifts. Will add more new items soon.